Can you love the art but hate the artist? That vexing question, a thorn in the side of critics and connoisseurs for generations, has resurfaced repeatedly in recent months in the wake of the #MeToo movement. 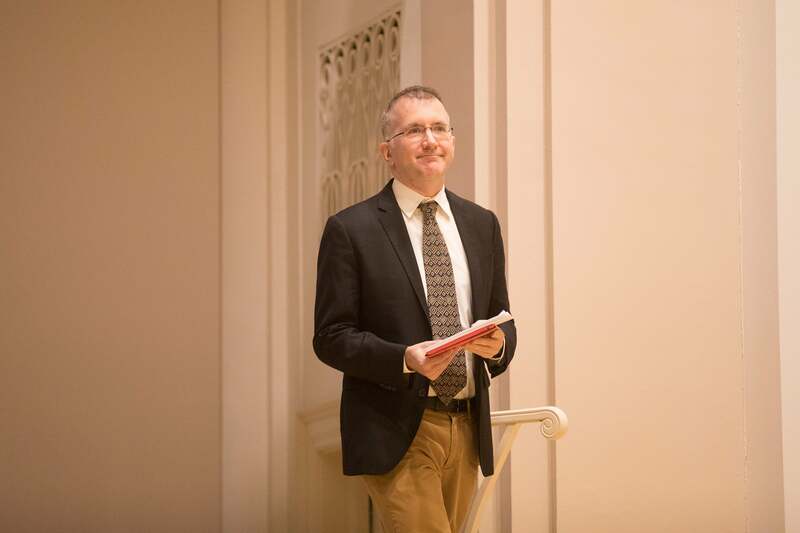 New Yorker music critic Alex Ross ’90 waded into the discussion on Thursday at Harvard’s Paine Hall, an airy performance space where a frieze spells out the names of some history’s most revered men of music. Delivering the Music Department’s 2018 Louis C. Elson Lecture, Ross homed in on one of those men, German composer Richard Wagner, a titan of 19th-century culture whose creative genius has long been complicated, and often overshadowed, by his anti-Semitism. For 10 years, Ross has been at work on “Wagnerism: Art in the Shadow of Music,” a book that explores the composer’s influence on artistic, intellectual, and political life. “It’s a massive subject because Wagner may be, for better or worse, the most widely influential figure in the history of music,” said Ross, who counts Baudelaire, Du Bois, Eliot, Kandinsky, and Mann among the artists and writers who fell under the composer’s spell. “Yet of the various Wagnerisms, the one with which most people are familiar is the Nazi version,” said Ross, referring to Hitler’s embrace of the composer’s work. If that idea is indisputable, Ross thinks it is less clear whether Wagner’s anti-Semitism laid the foundation for Hitler’s hate. He also questioned the depth of Wagner’s presence in Nazi culture. The reality of Wagner’s ugly political views means he can no longer be idealized, said Ross. Yet, “to equate him with Hitler ignores the complexity of his achievement and in the end does little more than grant Hitler a posthumous victory. The necessary ambivalence of Wagnerism today can play a constructive role: It can teach us to be generally more honest about the role that art plays in the world. Even so, while it may be a loss not to be able to experience Wagner today as a 19th-century listener did — with a “kind of total bewitchment” — current and future generations have a chance to approach the music with a deeper, more nuanced understanding, Ross said. "He has a driving curiosity about other people’s lives," VES professor Ross McElwee says about former student Lance Oppenheim (above) whose latest film premieres at Tribeca this week.